Children from overseas will gather in winter Hokkaido! 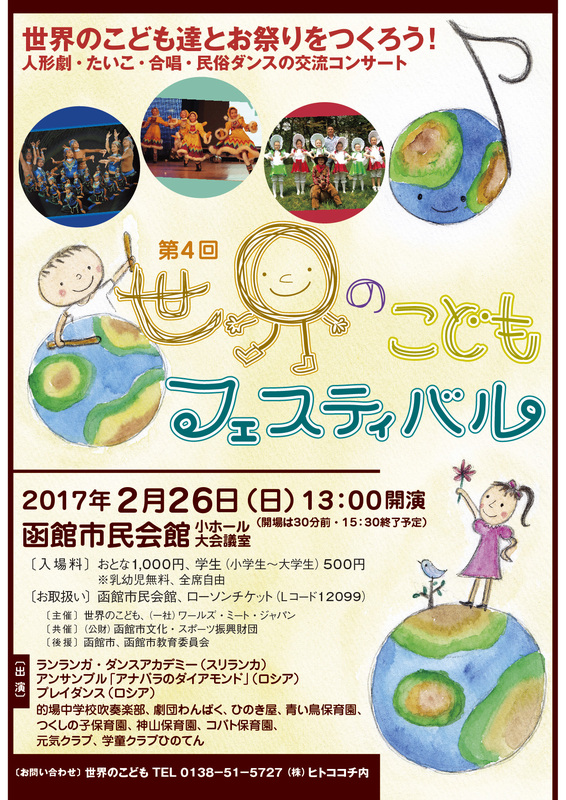 “Children of the World” is a heart-warming festival of world dance, music, chorus and friendship. Youth artists collaborate with local kids to build this festival together. For this fourth edition, there are three groups from overseas. “The Ranranga Dance Academy” from Sri Lanka, “Ensemble Diamonds of Anabara” from Russia and “Play Dance” group from Russia. Local groups include the “Hakodate Matoba JH School” Brass band, and a special appearance by the young-at-heart Hinokiya. The high quality performances by children at this event always impress the adult audience. We are waiting to present you with a unique atmosphere to chase away the winter blues. Grops: The Ranranga Dance Academy (Sri Lanka), Ensemble Diamonds of Anabara (Russia), Play Dance (Russia), Hakodate Matoba JH School, "Honorary Kids For The Day" Hinokiya and more. Fee: 1,000 for Adults. 500 for Students. Free for babies and little children. Tickets: Available in Hakodate Shimin Kaikan and at door. Organiser: The Children of the World Committee, Worlds Meet Japan GIA. Co-organiser: Hakodate Culture and Sports Shinkou Zaidan foundation.